Our holiday rentals and accommodations for dogsledding holiday or multi-activities trips (Winter and Summer) are located next to our house, on our estate called Svanfors. In the heart of the boreal forest and bordering the Skellefteå river, you will enjoy peace and silence, far from crowds and overcrowded resorts. You will be accommodated either in the traditional Swedish house in the colors of the famous Swedish red, which we called “Tall” or in the stuga called “Björk” located just next to the traditional house or in the stuga called “Gran” located right next to our house. “Stuga” is part of the Swedish cultural heritage! It is the typical small wooden chalet, always located at the edge of a lake or a river; a small wooden holiday cabin where Swedish families love to meet and spend their weekends and holidays. For them, stuga is synonymous with rest, activities in and with nature! 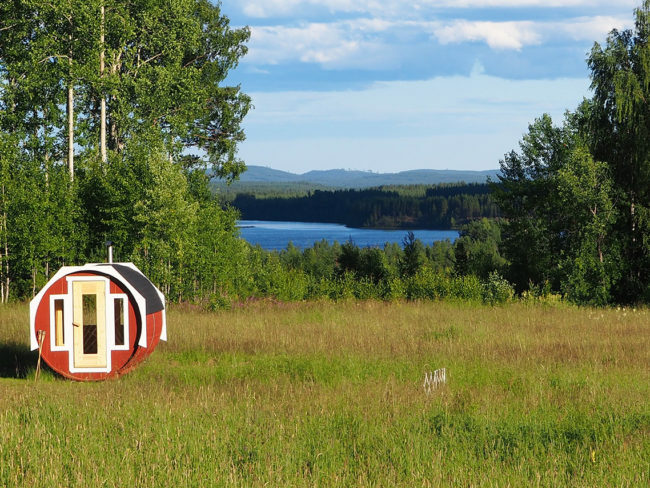 The “stuga” is more than a small wooden cabin, it’s the Nordic lifestyle, the Scandinavian philosophy. All our vacation rentals and accommodations are equipped with wireless internet. The central heating is with wood. It is accessible to people with reduced mobility. Barrel-shaped sauna, original and typical in the Scandinavian countries, with breathtaking view on the Skellefteå river. A moment of relaxation and relaxation awaits you after the day of activity! The Kota Grill, an authentic octagonal wooden hut, very common in the Nordic countries, with the grill area in the middle and the reindeer skins all around. Place where we find ourselves for our lunch during a stay Multi-activities Winter and Summer. A nice outdoor Grill-BBQ area for our aperitifs under the midnight sun (in summer) or under the spectacular spectacle of an aurora borealis (in winter). a private beach at the Skellefeå River, a few meters from your accommodation: for swimming at all hours under the midnight sun (summer). We put all our care so that all our vacation rentals in Lapland and accommodations are of quality, clean and pleasant: all activities are in the immediate vicinity (and especially no transfer) … in an authentic natural, friendly and warm, far from any commercial environment. If you opt for a simple vacation rental in Lapland, the traditional house “Tall” is perfect: the kitchen is fully equipped to prepare and take your various meals. If you are on a dog sled or multi-activities summer or winter, we offer full board and we bring in your home meals.